Just received results from the recent Karnataka State Board Exams (Std X) for students at the Shanbhag School in Kumta, Karnataka. What a spectacular performance by the students! Congratulations! Our gratitude also to the teachers who do a fabulous job, every day! Of the two Shanbhag Scholarship recipients in the graduating class, one received 90.4% and the other 69.9%. Excellent performers and we are elated to have contributed to their studies. I hope they will be equally successful in college and in life. I don’t expect our needy scholarship recipients to be at the top of the class, but we have given them an opportunity to study alongside the best students, at the best school. And they held their own. The network effects of this alone are worthwhile. This is akin to bringing deserving students to study at Harvard. You wouldn’t expect them at the top of the class, but just being here, they gain tremendously. Exactly that! I am still collecting funds to support scholarships for needy students at the school. If you would like to make a small contribution, please let me know. Lunch at the Shanbhag School – my favorite! It is sad that in India, places of worship are being targeted to achieve political ends, or vent frustrations. This is absolutely wrong! Temples, churches, mosques, and all other places of worship are sacred and should not be pawns in political movements. People should feel empowered to use objective fora to address grievances. Politicians! Make it happen and stop using these incidents to advance narrow political gains! In an attempt to address the grievances, the Karnataka state government blames “the flow of foreign funds,” for conversion of Hindus into Christianity. I have previously written about the Shanbhag School, an academic beacon in Kumta and surrounding villages. 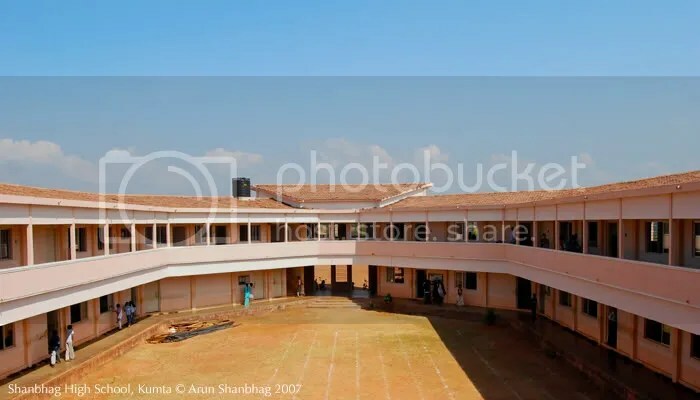 The Shanbhag High School, managed by the Konkan Education Trust does not receive any governmental aid. But it follows the state determined academic syllabus and guidelines. While we attract many students who can afford fees, our family wanted to make good education particularly accessible to the poor. Thus last year we gave 16 scholarships to very needy students to attend either the Shanbhag High School, or the affiliated primary school, Saraswati Vidya Kendra. 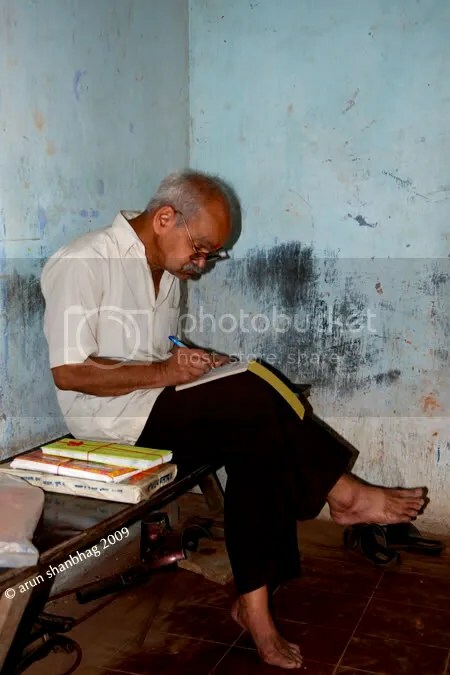 At a new site dedicated to our Scholarship activities, (Shikshan.org), you can browse the list of Scholarship Recipients for 2007-2008. You can also read about my personal challenges in identifying needy girls: Where are all the needy girls? We did not rest, last December (2007) during my travels to Kumta I visited most of the scholarship recipients in their homes. The visit served two purposes: (a) to meet the families and convince them of our commitment to support their child’s education ~ and in turn expect them to make education a priority; and (b) to ensure that these were indeed needy families, which I could determine from their living conditions. They lived in simple 1 or 2 room homes, or with relatives, and it was emotionally overwhelming to experience the gratitude of these families. Below, I share with you some of the scholarship recipients in their home settings. Appropriately I have omitted their names. We supported the boy in the center, flanked by his father and cousin sister. Being poor, the girl was enrolled in the local government run Kannada language school. She wanted to attend our English school, but being in 8th std (grade) it would have been academically disastrous for her to switch the language of instruction a year before the State Board Exams. This was an important reason why we started giving scholarships to students in primary school! Raagi Bhakri is a favorite in our home. It’s easy to prepare and very filling. 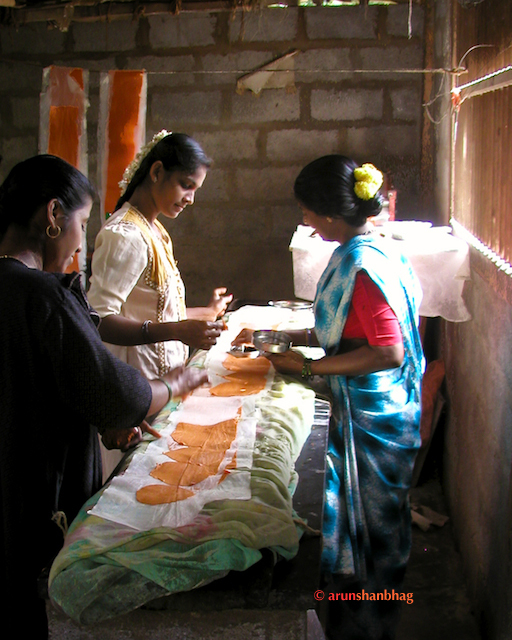 During this past visit to Kumta I replenished our stock of Raagi flour. A few blocks from our place in Kumta is a little “girNi” (or mill) which grinds various types of flour. 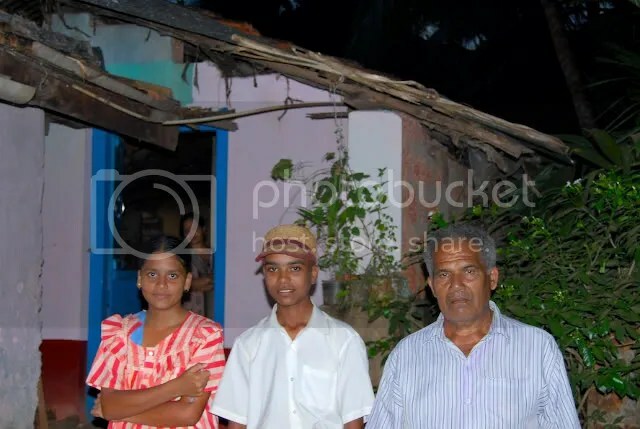 It is run by a distant relative ours; apparently everyone in Kumta is related to each other! And fortuitously for me, he was milling raagi flour that day. So here’s a little tour of the making of Raagi Flour. 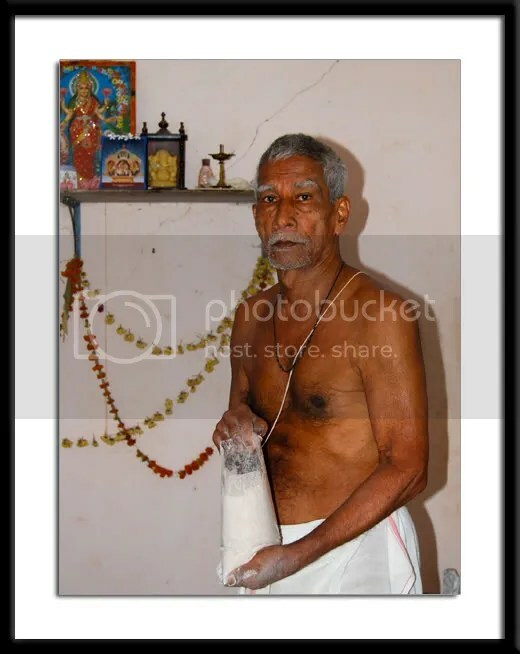 Above – Shanbhag maam (in Kumta I call all elders by this honorific ~ we are all related, you see) poses with a bag of Raagi flour. When I first posted on the Shanbhag School, the upper floor (1st floor) was still under construction. During my visit in Nov, it was a thrill to see students enjoying lectures in the new classrooms. You can see pics of ongoing classes later in the post. But first, an important question: How are the students performing academically? WoW! Congratulations to the students on their excellent performance. Also a big pat on the back for the teachers who did an outstanding job of educating the young. Since the Shanbhag School is a private school, it does not receive any Government subsidies or aid. Thus the teacher’s salary are much lower than at local government-aided schools. The dedication of teachers to teach is thus so much more appreciated. The 2008 exams has recently concluded and it will be some months before the results are out. Here are a few pics of ongoing classes. Note: I did not know that Thursdays are “casual Thursdays” and students did not have to wear their blue and white uniforms (which you see in this post). Thus the school took on a festive appearance. YaaY! It was a fabulous November afternoon. Looking towards the front of the school. For comparison, see here for pics from a few years ago.